Carotid artery disease is the most common cause of stroke, which remains one of the most disabling conditions in our society. Many strokes could be avoided with early recognition and treatment of carotid artery disease. Atherosclerosis, the disease that affects our heart arteries and causes heart attack, is the same pathology that affects the carotid arteries. 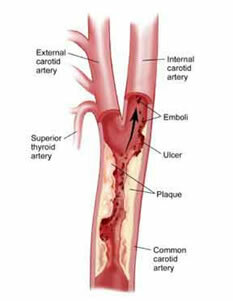 Build up of atherosclerotic “plaque” in the carotid arteries in the neck leads to the possibility of small bits of the plaque breaking off (emboli) and travelling with the blood flow to the small arteries in the brain, blocking these arteries and thereby causing a stroke (death of that part of the brain supplied by the blocked artery). These are the same risk factors that result in the formation of atherosclerotic plaque/ hardening of the arteries throughout the arteries in the body. It is important as part of the management of carotid artery disease to optimise these risk factors to prevent progression of plaque formation. Disease in the carotid artery may be silent (asymptomatic), or can result in symptoms of a transient ischaemic attack (TIA) or a stroke. 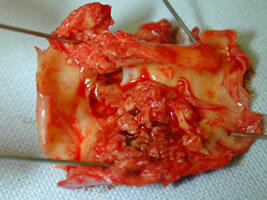 TIA (also known as a “mini” stroke) is a condition that resolves within 24 hours. It means that you are at increased risk of a more major stroke in the near future. Some patients are lucky enough to have these “warning” attacks, though the symptoms (see below) are too often ignored as they may resolve very quickly. A stroke results in a permanent neurological deficit. Unfortunately, a stroke may be the first presentation of carotid artery disease. The first part of diagnosis is to recognise either those at risk or the warning symptoms (TIAs above). Those most at risk include males over 55 years of age, history of previous smoking, known heart disease, high blood pressure, diabetes, high cholesterol, family history of heart attack or stroke. Patients with any of these risk factors should be considered for “screening” of their carotid arteries which can be done simply and non-invasively with good vascular ultrasound. This provides an accurate estimation of the degree of narrowing caused by the plaque. The severity of narrowing is directly related to the risk of stroke. If more information is required, CT scanning or Magnetic Resonance Imaging (MRI) can be performed, though is rarely required. 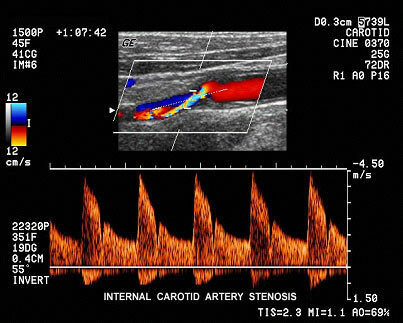 Treatment options for carotid artery disease will depend on the severity of stenosis (narrowing) of the artery, whether the patient is symptomatic or asymptomatic and general health or other conditions affecting the patient. All patients identified with carotid artery disease (or with risk factors for atherosclerotic disease in general) should be treated with control of these risk factors. In particular, control of blood pressure and diabetes, smoking cessation, control of cholesterol and blood “thinning” agents such as low dose aspirin therapy if no contra-indication exists. 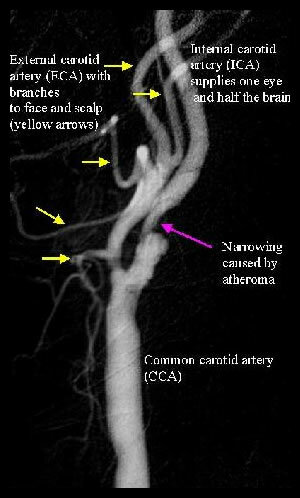 Specific treatment for carotid artery disease includes surgery (carotid endarterectomy, CEA) or carotid artery stenting (CAS). Carotid Endarterectomy:This is an operation that involves removing the plaque from the artery thus preventing further debris travelling to the brain. It can be performed under local or general anaesthetic. Whilst general anaesthetic is probably more common, there is a growing trend to performing the surgery under local anaesthetic around the world. Our practice has been performing the surgery under local anaesthetic (with some sedation) for many years with a belief that this is lower risk for the patient. 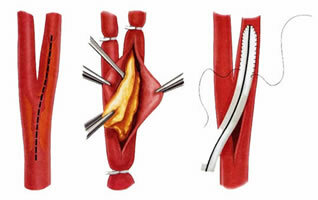 After removing the plaque from the artery, the artery is repaired by sewing a synthetic patch to the artery to minimise the risk of further narrowing the artery. Hospital stay is usually short at 1 or 2 nights with relatively quick recovery times for most patients. 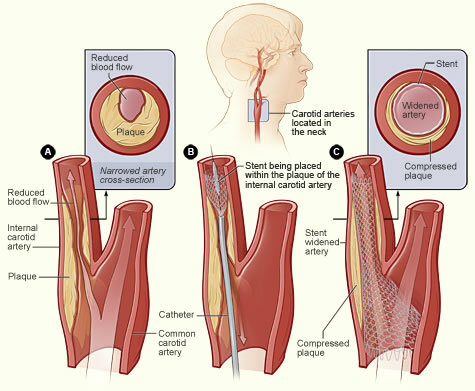 Carotid Artery Stenting: In this procedure, a stent is placed over the plaque within the artery thereby stabilising it, rather than removing it. This is performed through a small puncture in the groin as for any angiogram. Hospital stay is similar to surgery (1 or 2 nights). 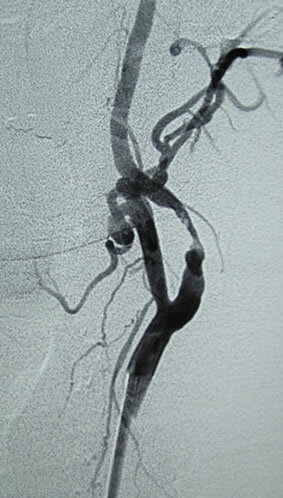 Whilst it sounds simpler than surgery, carotid artery stenting is not without some risk. The advantages and disadvantages of both of these procedures (CEA and CAS) can be discussed during consultation. Remember that as vascular surgeons, we are able to offer non-biased advice on BOTH of these procedures, both of which are performed by us, as opposed to non surgeons who can only offer non-surgical treatment.”Minimally Invasive” treatment always sounds more attractive but may not always be the best or safest option for every patient. We are able to tailor the most appropriate treatment plan to the individual patient.